Dale Earnhardt , the legendary NASCAR Champion and man they called 'The Intimidator #3" will forever be a bigger than life stockcar racing superstar. Due to his enormous racing championship successes, and fan popularity it would be doubly ironic that the sport he excelled at eventually was his "final finishline." 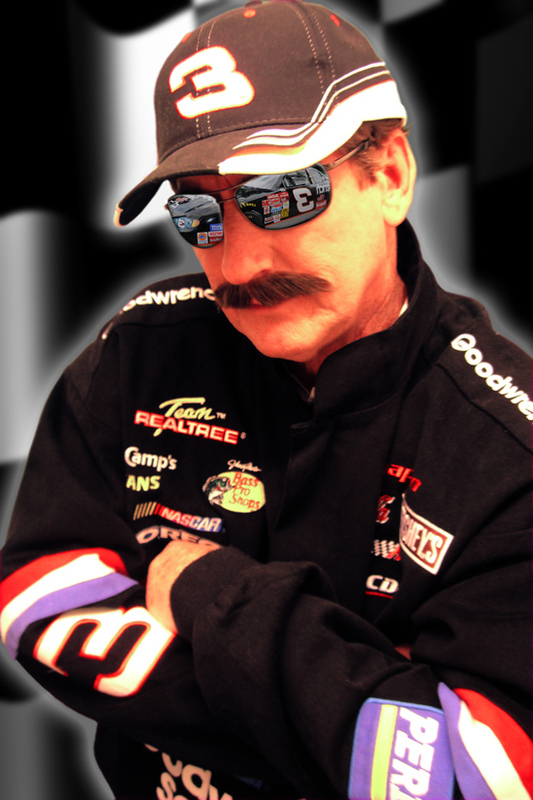 Tim Beasley is proud to achieve a living resemblance to this great stockcar racing champion, a highly recognized figure in his racing jacket, bug-goggled shades and bristly mustache. . .and Tim is tall and lanky as him as well, with a knowledge of the sport and the background life of #3. Engage Tim as 'Dale Earnhardt" for your NASCAR theme events....he's sure to attract lots of attention and everyone wants a photo with him as #3 as well!